A 6mm x 6TPI blade is a good choice for tighter curves in material generally between 10mm and 40mm. Blades with 6TPI are ideal for straight cutting as well as curves. The amount of Teeth Per Inch relates with the thickness of timber it is capable of cutting. The fewer the amount of teeth, the more sanding will be needed to clean up the surface yet will cut quite quickly, and the more the teeth the cleaner the cut will be, yet will cut a lot slower. Thicker timber is going to require a blade with less teeth to cope with such a cut. 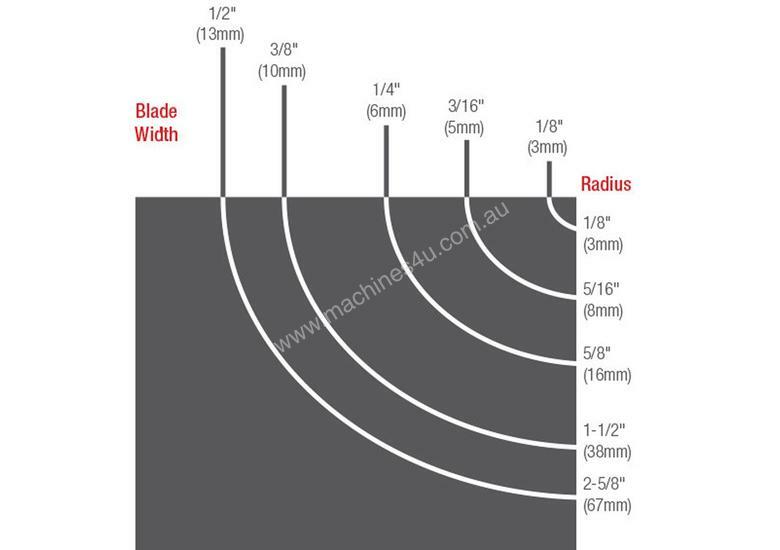 The width of the blade, which is measured from the back of the blade to the tip of the teeth, will determine the radius the blade is capable of cutting, the smaller the blade means the tighter the radius possible. Likewise, the larger the size, the more it is designed for ripping in straight lines and less capable of cutting arcs and curves, to the point where only straight cutting will be done.